The ITV testing station now has a 4 month delay. This is despite the measures announced by the Consell in June, in which they intended to cut the waiting list, then standing at 3 months, to just 2 weeks. The first available appointment is mid-December, if you are happy to have an afternoon appointment; it seems morning appointments are far more in demand with a longer waiting list. A driver whose ITV runs out in November, explained that when she asked for an appointment, three months in advance, she was given the 5th December. Another, whose car’s ITV expired in March was given an appointment for the 1st December. There are days when, in a timely manner, spaces open and a closer appointment can be made. That is the case of a user who reported that three weeks ago he accessed the website to get an appointment and there was only availability in November; he did not take it, two days later he came back into the system and at that moment an appointment appeared in late September, so he got one. It seems however, the general trend is to wait for months. The Diario de Ibiza spent more than two weeks accessing the system and the reality is that if there were appointments in the beginning of mid-November; they quickly ran out, going from three to almost four months waiting to get a date for the inspection. The waiting list is not the only drawback to gaining an ITV, the Diario de Ibiza recently checked out the long queues of vehicles awaiting their turn at the station, which formed shortly after nine in the morning. Again nothing has changed since June. One driver, Olivia Lartigue, said that she was in the queue waiting for her turn with a delay of more than 1 hour and 20 minutes. “I had an appointment at 10, let’s see what time it is [11.20] and I still have ten cars ahead,” explained Lartigue from inside her car, “very angry” with the situation. According to this user, there were only two of the four inspection lines open, hence the long wait. “After 2 hours and 20 minutes, ITV has been achieved!” she said at the end of the inspection. All this despite the fact that in June the Consell explained that measures were being taken this summer to remedy the situation, to get an appointment in less than two weeks and that in carrying out the inspection you wouldn’t be more than half an hour at the station. These measures included charges for second inspections or a new queue management system in the office, to be applied this summer, as well as more personnel and a change in the computer system, in the longer term. The island’s industry minister, Marta Díaz, acknowledges that the service provided is not good. She indicates that although there is not “the seven and a half months” waiting list, that was when the progressive government team arrived at the Consell in 2015, “four months” of waiting are not adequate either. Diaz relates the situation with the increase in the number of vehicles – in 10 years it has grown 118%, going from 63,062 in 1996 to 137,464 in 2016; with the average age of cars, standing at 13.25 years, and that for some years no prior inspections have been made in the workshop, thus the first ‘failed’ inspections have increased greatly. “They must pass the ITV twice and that entails an extra workload,” she says and points out that the total number of inspections carried out has grown by 18.73% between January and July 2017 compared to the same period of 2015. Diaz explains that although when they came to the government they increased the workforce of mechanics, engineers and auxiliaries – which did allow the waiting list to be lowered to between one to two months in 2016 – this year there have been three retirements of mechanics. “This plan will not be the last one we do. If it does not work we will have to look at another measure “, Diaz says. 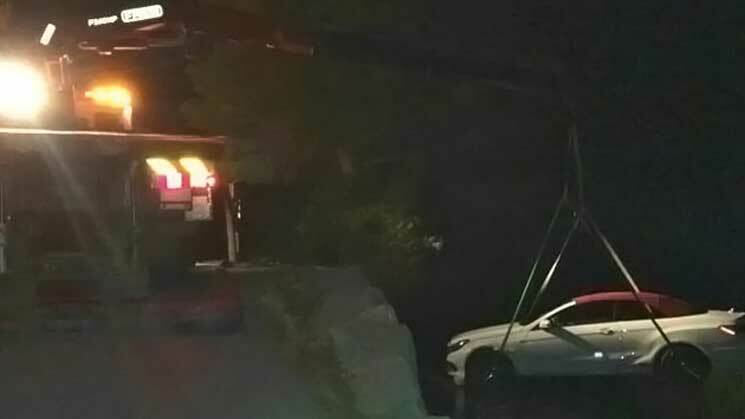 A vehicle which left the road and fell around 8 metres on the road to hotel Xamena in San Miquel at around 9pm on Thursday required a rescue team with a crane to remove the stricken vehicle. The recovery took around three hours as they tried not to damage the high end Mercedes. None of the occupants were hurt.